From the Hancock County Courthouse, go east 2 blocks (0.2 mile) to Boland Street. Turn right on Boland Street (which eventually becomes Linton Rd) and go 11.5 miles to Hitchcock Cemetery Road on the right. Turn right and follow Hitchcock Cemetery Rd for 1.8 miles. Turn left on Indian Trail Rd and go 3.2 miles until it dead ends into County Line Road. The cemetery is located on the left and is at the corner of County Line road (County Rd 331) and Indian Trail (also known as H. B. Dixon) Road on the southern boundary of the county. Graves numbered 70 and above have been listed based on obituaries. Based on the obituaries, these persons should be somewhere within the cemetery. No marker on grave - a possible grave that might be Freddie Poole, who is buried in the first row next to the highway, per Crawford Jones. Dates are painted over and unreadable. w/o Oscar Daniels. All info per Crawford Jones. Death year difficult to read. Age (no longer visible). All information hard to read. 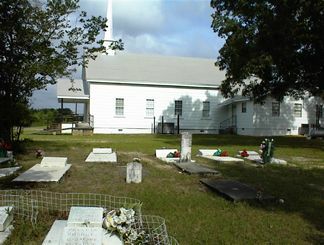 Enclosed in fenced area with graves 37-42. Almost impossible to read. Death year not readable. Is within fenced area. Is listed on an adult-sized slab with graves 41 and 42. Is within fenced area. Is listed on an adult-sized slab with graves 40 and 41. Is within fenced area. Age 74. All info from obituary. Age 54. All info from obituary. Age 41. All info from obituary. Age 51. All info from obituary.